Plants which look brown or shrivelled – they are probably dead. Plants which have odd-looking, thin and straggly growth – this is called etiolation and means that they have not been given enough light in the garden centre. Some garden centres sell plants in coloured glazed pots, miniature tin buckets or other silly containers without drainage holes. If you buy these repot them immediately into a pot with drainage holes. If you do not do this these plants will die. Mealy bug – small white insects that look like miniature wood lice. The picture shows an adult bug on the left and its eggs, hidden in white fluff on the right. Root mealy bug – similar to mealy bug but a little smaller, this hides away on the roots of the plant. Red spider mite – you never see red spider mite – only the damage it causes. 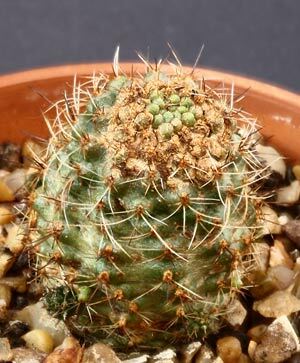 It nearly always appears at the top of a plant, and will grow out into a ring of damaged skin as seen here. Most pests can be dealt with by spraying with the right sort of insecticide – ask your parents for advice and always be very careful. Don't breathe in the fumes and don't spray near your pets. For root mealy bug wash the roots of the plants in soapy water – make sure you get rid of every trace of the pest and its eggs. Then leave the roots to dry before repotting.